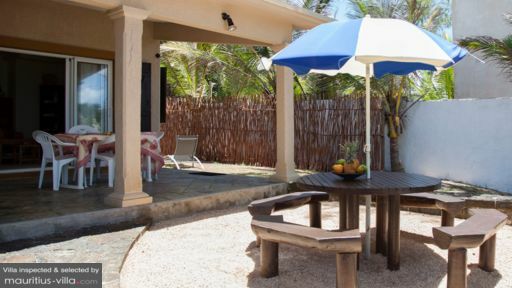 Villa Quatre Vents is a four bedroom beachfront getaway that offers you a taste of the island’s blue waters. 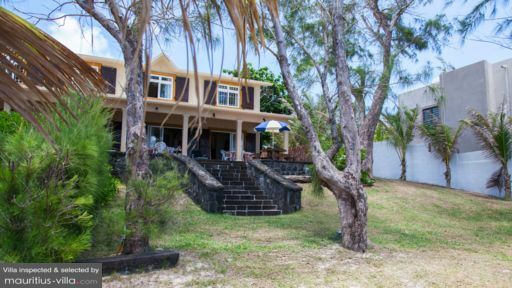 Complete with a verandah facing the sea, a private swimming pool, the option for a boat cruise, and a personal cook, Quatre Vents is the kind of villa where the whole family is sure to have a great time. Whether it’s grilling in the backyard, chatting in the comfortable lounge, or splashing around in the sea, this villa is perfect for some quality bonding time in a beautiful tropical setting. The master suite is a comfortably furnished room with a pleasant view of the beach. It has a double bed, a desk, and chair where you can read a book or use your laptop for a while. This room also has an en suite bathroom where you can wash away the sand from your hair in complete privacy. The room also comes with a walk-in wardrobe. There are three guest bedrooms in this villa. Right next to the master suite is a children’s room. This setup is perfect for couples that want their own privacy while having their kids nearby. The children’s room comes with a wooden bunk bed and overlooks the pool and garden area. Next to the children’s room is a bathroom. Also near the master suite is the blue butterflies room with two joined single beds. The room also has ample wardrobe space and a small study area. It overlooks calming blue waters. On the ground floor is the marine room with a comfortable mattress good for two and a nice view of the sea. This room also comes with a large en suite bathroom. What better way to enjoy what Mauritius has to offer than by getting a front row seat to its stunning blue waters and lush greenery. In this villa, there are two terraces. The first one fronts a beach and the sea. Here you can sit on a wooden bench and read a book while watching the gentle sway of the leaves from the surrounding trees. You can also spread out a towel under the nipa umbrella by the beach. When the sun gets too hot, you can always jump into the cool waters. The second terrace faces the villa’s lush green garden and private swimming pool. There are two lounge chairs by the pool and a small dining area that seats four. In the evenings, you can fire up the grill and have a fun barbecue night with family and friends. When it gets too hot outside, you can relax in the villa’s living space. There is a lounge area with comfortable rattan sofas and an arm chair. You can kick back and enjoy a view of the beach and the sound of the waves. The dining area also has a similar view and can seat up to eight people. There is also another lounge area with chairs surrounding a TV. Near this TV is the kitchen. Here you, or the cook, can prepare meals that the whole family will enjoy. 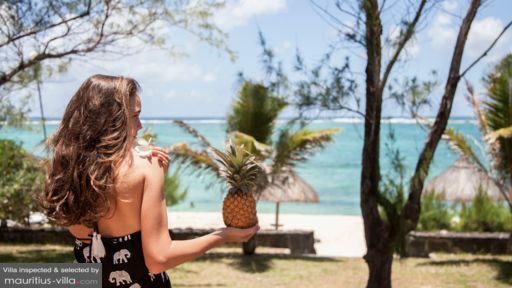 The staff here at Villa Quatre Vents will help you have a fun filled holiday that is all about reconnecting with the people, and activities, that you love. There is a housemaid that will come and ensure the villa stays clean and comfortable. The villa also comes with an alarm system for your safety. There is also WIFI access in the villa. If you don’t want to think about meal preparation, a cook is available to create your meals for you. Villa Quatre Vents is located in proximity to Trou D’Eau Douce, a seaside town that is popular amongst tourists. While the beach is only a few steps away from the villa, there are also a few other activities you can do around the area. For your relatives who love to fish, a fishing trip can be arranged. If you want to explore some of the islands around Mauritius, you can take a boat cruise and visit the Blue Bay Marine Park. The popular Ile aux Cerfs, with its white sand beaches and turquoise waters, is a 10 minute boat ride away. Here you can snorkel, play watersports, and have lunch in one of the restaurants on the island. When you want a change of pace, there is a golf course around 10 minutes from the villa. Belle maison avec tout le confort. Conforme aux photos "les pieds dans l'eau". Accueil très sympathique par les propriétaires... Notre aide ménagère "Brigitte" était aux petits soins ET surtout une excellente cuisinière ! Séjour très agréable. A refaire !